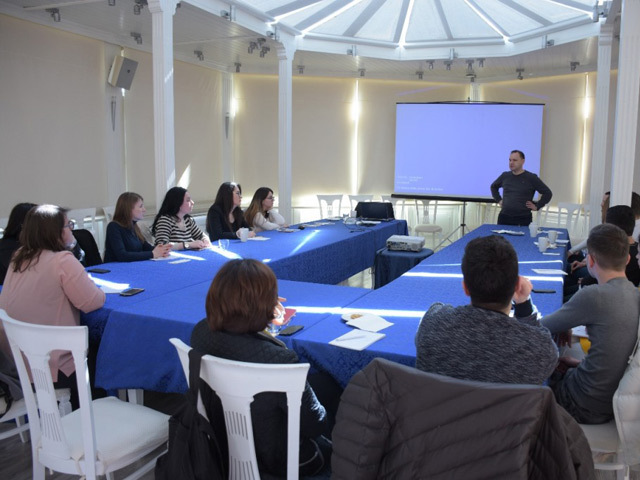 The Balkan Investigative Reporting Network in Albania held a training session on March 10 in Tirana about media advocacy with young activists from grassroots and civil society organisations working to promote issues concerning minority rights, criminal justice reform and equal access to higher education. The training session, which was attended by 17 civil society activists, was held with the support of the Balkan Trust for Democracy, BTD. The training was led by BIRN Albania editor Gjergj Erebara and centred on the the diversity of interests that draw the media’s attention to various issues, how different types of media function and techniques through which successful public mass communication campaigns can be built. The participants were informed about the ethical dilemmas that stories written by journalists and information distributed by press offices might present. The same dilemmas are central also to activism campaigns and a focus was added on how to avoid propaganda techniques. BIRN photojournalist Ivana Dervishi shared photographic techniques with the activists and NGO representatives, speaking about how to photograph in difficult situations and explaining photojournalists’ rights. During this session, the group also learned how to give exposure to social issues using photography and how to pitch such photo stories to media outlets in the country.